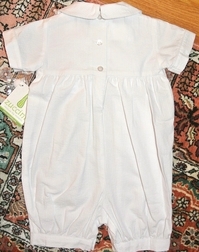 We just love this simple yet sophisticated straight leg bubble~romper for baby and toddler boys. 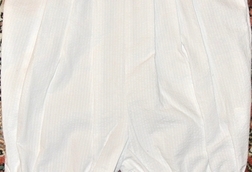 It is made in white seersucker fabric and has a sweet Peter Pan collar and the adorable feature of a button on white tab perfect for monogramming. 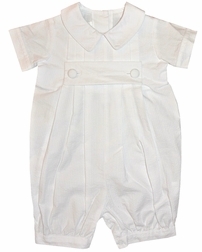 The little outfit is perfect for Christenings, weddings, church and other special occasions.